If you’re interested in a Ford-branded cargo van, there are two choices: the Ford Transit van and Ford Transit Connect. Comparing these options will help you make an informed decision that’s best for your organization’s needs for the long term. The following will help you decide which might be the ideal option. In addition, South Bay Ford Commercial is here to help with the process. Contact us to request info on Ford Transit cargo van dimensions or anything else you want to know. We’re always happy to help. The Ford Transit and Ford Transit Connect are two quite different cargo vans. One thing that makes this obvious is the exterior specs for these vehicles. You can get the Ford Transit in a range of layouts, some large enough to take on any job. The shot wheelbase and low roof option measures 219.9 inches long, 129.9 inches for the wheelbase, and 83.6 inches tall. The long wheelbase and low roof option is 237.6 inches long. With the medium roof and short wheelbase, the cargo van is 217.8 inches long and 100.8 inches tall. The medium roof and long wheelbase is 235.5 inches long and 100.7 inches tall. The short wheelbase and high roof is 235.5 inches long and 110.1 inches tall. With the long wheelbase and high roof, those dimensions shift to 263.9 inches long and 109.4 inches tall. The Ford Transit Connect is a much smaller vehicle, which means it’s easier to maneuver through tight spots. With the short wheelbase, the cargo van measures 174.2 inches long, 104.8 inches for the wheelbase, 84.1 inches wide, and 72 inches tall. The long wheelbase expands the length to 190 inches and the wheelbase to 120.6 inches. The differences between the Ford Transit and Ford Transit Connect includes the interior of these cargo vans. Of course, the configuration you order of each has a direct impact on how much space there is. As you saw above, the most options come with the Ford Transit. A model with the medium wheelbase and low roof contains 246.7 cubic feet of cargo volume, versus 315.2 cubic feet if you add the medium roof. The long wheelbase and low roof combination results in 277.7 cubic feet of cargo area, which increases to 357.1 cubic feet for carrying cargo. That balloons to 404.3 cubic feet of cargo with the high roof. The most cargo space comes with the long extended wheelbase and high roof. Being a smaller cargo van, it shouldn’t be surprising that the Ford Transit Connect doesn’t contain quite as much cargo space. Still, for its compact size it can carry a surprising number of items. With the short wheelbase it contains 103.9 cubic feet of cargo area. The long wheelbase layout expands that to 128.6 cubic feet. As you’ve already seen, the Ford Transit and Ford Transit Connect are two very different sizes. Because of that gap, they also utilize dissimilar engines. Ultimately what that means for you is greater diversity in your options, so finding the right cargo van is easier. For the Ford Transit, there are three engine options. The base 3.7-liter Ti-VCT V-6 gasoline engine puts on tap 275 horsepower at 6,000 rpm and 260 lb.-ft. of torque at 4,000 rpm. An all-around performance uplift comes with the optional 3.5-liter EcoBoost V-6. Turbocharging and direct injection help push output to 310 horsepower at 5,500 rpm and 400 lb.-ft. of torque at 2,250 rpm. For a nice balance between performance and efficiency, the 3.2-liter inline five-cylinder diesel engine is a great option. It provides 185 horsepower at 3,000 rpm and a solid 350 lb.-ft. of torque at 1,500 to 2,500 rpm. Two engine choices exist for the Ford Transit Connect. A base 2.5-liter Duratec DOHC inline four-cylinder makes 169 horsepower at 6,000 rpm and 171 lb.-ft. of torque at 4,500 rpm. The alternative, a 3.5-liter EcoBoost V-6, provides 178 horsepower at 5,700 rpm and 184 lb.-ft. of torque at 2,500 rpm. 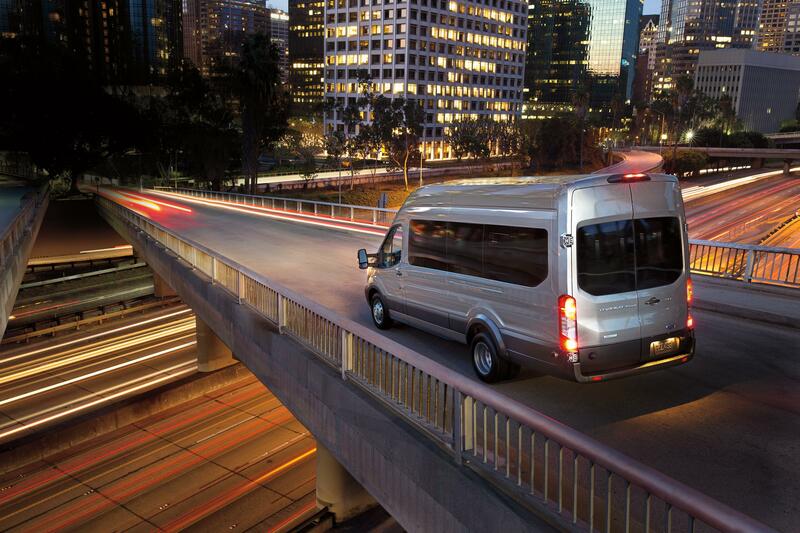 Contact South Bay Ford Commercial today for even more information about the Ford Transit or Ford Transit Connect.